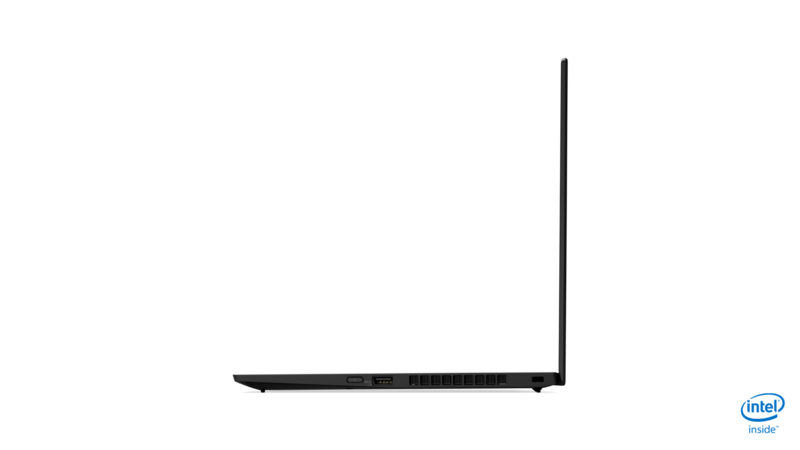 Lenovo brings a new version of its ThinkPad X1 Carbon to the CES. The new Lenovo ThinkPad X1 Carbon Gen 7 includes a revamped chassis with a Carbon-Fiber coating as well as the newest Intel CPUs and a brighter FHD screen option. 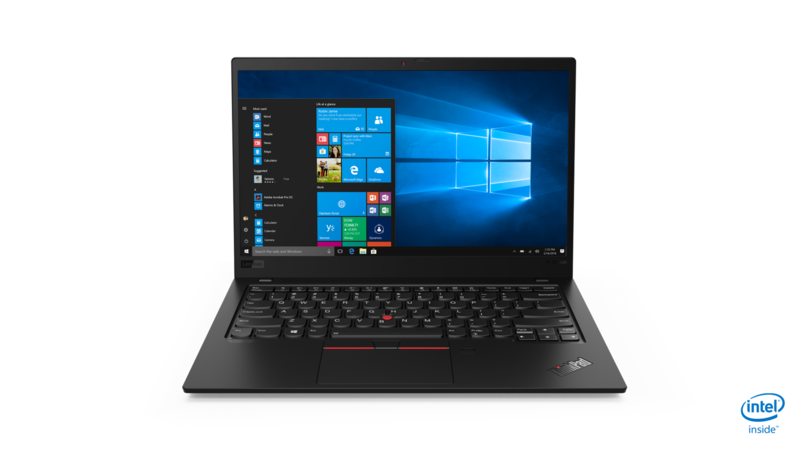 Same procedure as every year: A new year has arrived, CES in Las Vegas is underway and Lenovo launches a new version of its ThinkPad X1 Carbon. Since 2014, Lenovo has announced a new X1 Carbon at CES every year and they are not gonna stop in 2019, because the Lenovo ThinkPad X1 Carbon is a very popular business-laptop. 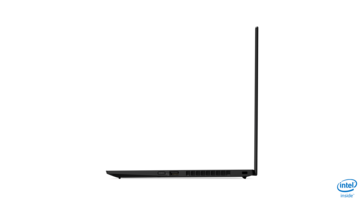 It is also one of the most well-known models of the ThinkPad-lineup and one of the more expensive ones. 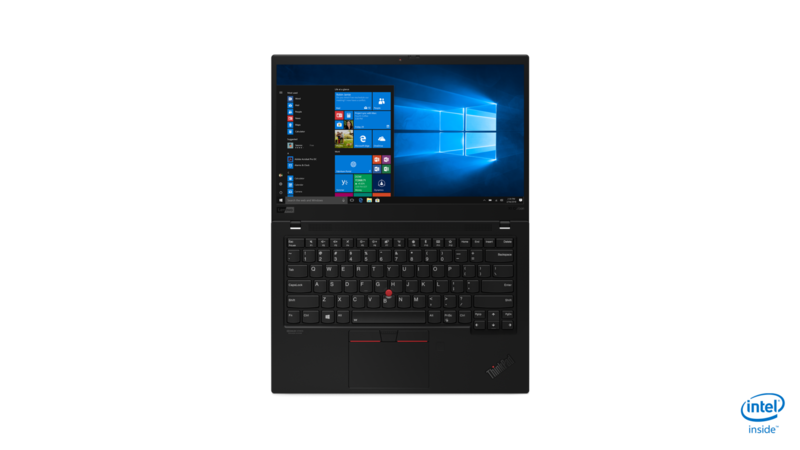 The new Lenovo ThinkPad X1 Carbon 2019 is not just merely a CPU-update – although of course, the newest Intel Whiskey Lake processors are included. For the first time since 2017, Lenovo introduces a new chassis to its high-end ultraportable line. This enables various changes that weren't have been possible with a simple platform-update. Of course, the newest version of the ThinkPad X1 thinner & lighter than the previous one, with a thickness of just 14.95 mm and a weight of 1.11 kg (X1 Carbon 2018: 15.95 mm / 1.13 kg). 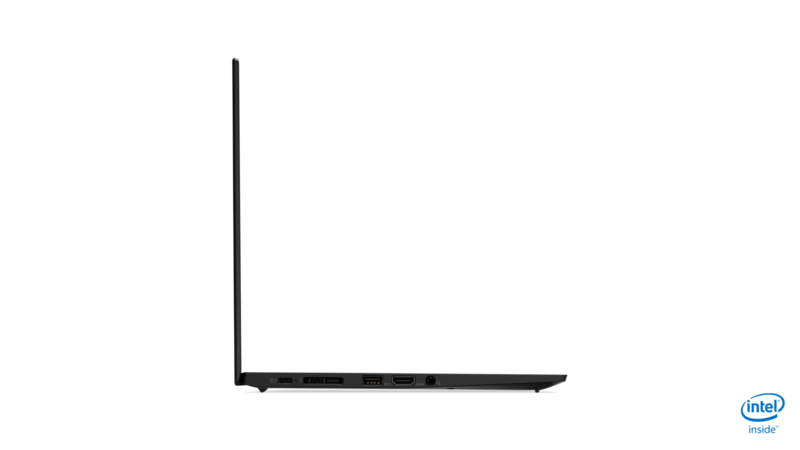 Meanwhile, the port selection remains unchanged, the new X1 Carbon 2019 still sports full-size HDMI as well as two USB A ports, different from the likes of the Dell XPS 13 9370 or Macbook Air 2018. A bigger change than that is the redesigned speaker system: The stereo speakers are now Dolby-Atmos-branded. 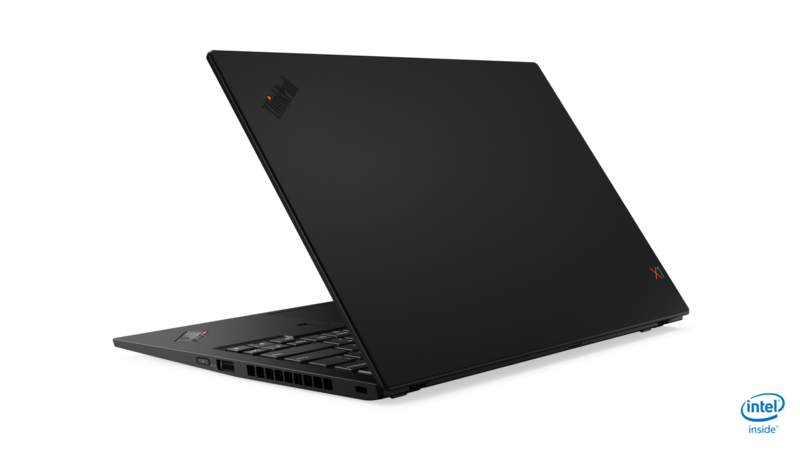 Not only that, they are also user-facing with speaker-grills above the keyboard – instead of down-firing as on the ThinkPad X1 Carbon 2018. Taking the position of the downward-firing speakers are two subwoofers, which promises a much better depth of sound. ...are supplemented by two new sub-woofers. 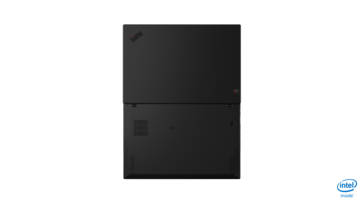 The chassis itself is still available in the classic smooth matte-black ThinkPad coating. 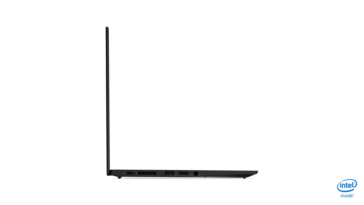 Not available anymore is the silver color that older models of the X1 Carbon came in optionally. Instead, there now is a Carbon-Fiber coating, which adds a visible rough woven Carbon-Fiber structure to the top-lid. 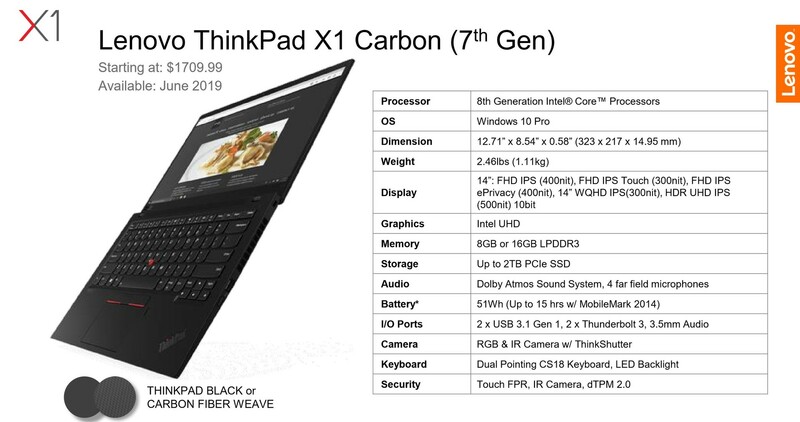 For the first time ever, the Carbon-Fiber of the Lenovo ThinkPad X1 Carbon 2019 is clearly visible for everyone. When it comes to the displays, the ThinkPad X1 Carbon Gen 7 will be offered with five different screen options and three different resolutions. Its 14 inch screens will either have a resolution of FHD (1,920 x 1,080), QHD (2,560 x 1,440) or 4K-UHD (3,840 x 2,160). The last option is new; the 4K-UHD panel will provide a brightness of 500 cd/m² and support HDR. The lower-end FHD display option is also updated with a higher brightness of 400 cd/m² and an optional ePrivacy solution. On the inside, the ThinkPad X1 Carbon 2019 still features LPDDR3 RAM, which means that its RAM still maxes out at 16 GB (soldered). The SSD-storage will provide a capacity of 2 TB maximum. 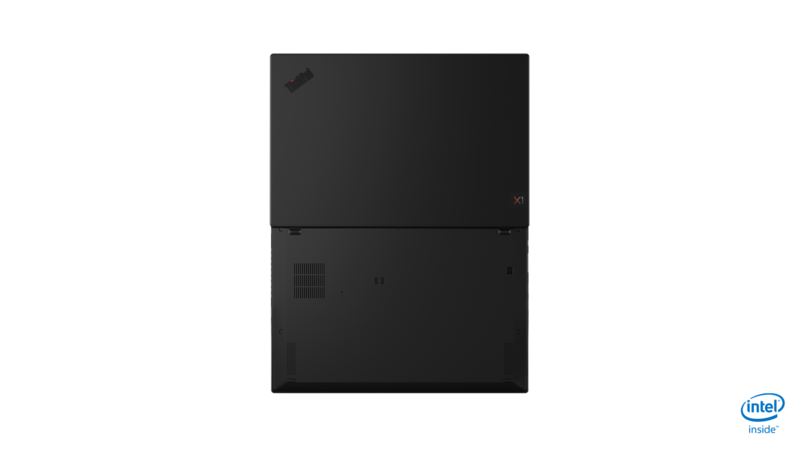 One step back happens in the battery department: The previous version of the ThinkPad X1 Carbon 2018 featured a 57 Wh battery, this gets cut-down to just 51 Wh on the ThinkPad X1 Carbon 2019 – possibly to make room for the newly-added subwoofers. Potential buyers of the Lenovo ThinkPad X1 Carbon 2019 will have to wait quite a while until they can buy it: It is supposed to be available in June 2019. Its base-price sits at $1710.